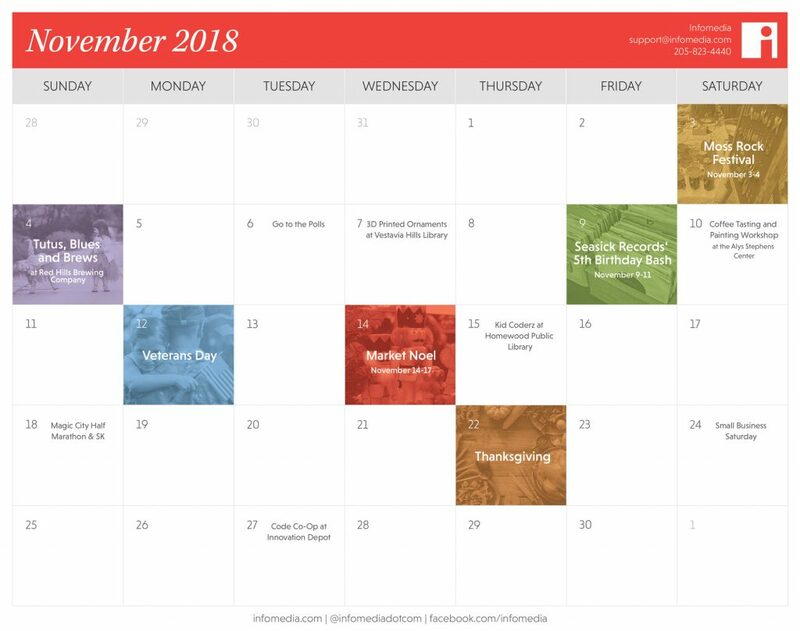 November wouldn’t be complete without shopping at small businesses, making custom ornaments or indulging in some delicious Thanksgiving food. And all of those things are easily done in Birmingham! Keep track of all the fun events by downloading our free calendar as a reminder. If you’re in need of inspiration for your business’s social media, check out our calendar and use it as inspiration for your postings. Celebrating its 13th year, Moss Rock Festival is an eco-creative event meant to explore nature, smart living, art and design. Held during the first weekend on November, the family-friendly festival holds a wealth of things to do including live music, local art vendors, a beer garden and outdoor activities for kids. Support a local nonprofit while attending this silly, family-friendly event. Tutus, Blues and Brews is a unique fundraiser for The Dance Foundation, an organization that promotes community involvement in the arts. Hosted at the Red Hills Brewing Company, the evening will include beer, food by Taco Mama and live music. Come dressed in a tutu or cape to join the on-site parade, or purchase one of the tutu or cape kits available at the event. Get out and vote for statewide and local elections. If you’re not sure where you polling place is, you can find it on Alabama’s website for the Official Election Center. What’s cooler than DIY Christmas ornaments? 3D printed ornaments! The Homewood Library is hosting a class for teens in grades 6th through 12th where attendees will be able to design and 3D print their custom ornaments. Space is limited, so signing up early is recommended. Birmingham staple, Seasick Records, is celebrating their 5th birthday with a weekend long party. The bash starts off on Friday and continues through Sunday, with live music, drink specials, discounted merchandise, birthday cake and more. Have your drink and play with it too at ArtPlay’s workshop coffee tasting and painting. Hosted at Seeds Coffee Co. the event will involve a global coffee taste test, followed by an art lesson using the coffee grounds to create watercolor paintings. Created by Raymond Weeks, a WWII veteran from Birmingham, Veterans Day is a great opportunity honor our those who served our country and attend some fun events around the Magic City. Watch the annual Veterans Day Parade around Railroad Park, get a free lunch if you’re a veteran at the Commons on UAB’s campus or attend the early morning Veterans Memorial Service at Cathedral Church of the Advent. Get in the Christmas spirit early with Market Noel, an annual fundraiser for the Junior League of Birmingham. Featuring over 100 vendors, the event is your one-stop-shop for buying clothing, art, gourmet food, holiday decorations and more. Introduce your kids to the concept of coding early on with the Kid Coderz class. Hosted at the Homewood Library, this class will cover the basics of programming and is intended for children in grades K through 1st. Bringing a laptop isn’t required, but is recommended. One of Birmingham’s most popular running events, the Magic City Half Marathon and 5k is a great way to celebrate the cool fall weather. The event drew a whopping 2,000 participants last year and benefits the Ruben Studdard Foundation for the Advancement of Children in the Music Arts. The run offers a beautiful run through the city, as well as a mile fun run or walk for all ages. Celebrate the day with friends and family over a delicious meal. If you’re looking to skip cooking, or just want to make things a bit easier on yourself, keep an eye out for local Birmingham restaurants that offer pre-made side dishes and desserts. Some of our favorites are Homewood Gourmet for their tasty casseroles and Cookie Fix for their frozen dough to go selections. Support local businesses by keeping your Christmas shopping in Birmingham stores for Small Business Saturday. Some of our staff favorites include Charm, Alabama Goods, Excelsior, and Original B’ham. Connect with other programmers at the Code Co-op for a night of helping and hacking. The event is held at Innovation Depot and the evening will be focused on connecting individuals with an interest in coding to facilitate collaboration and conversation around the subject.